We breed and select our cats according to the TICA Standard. The call of the wild right in your living room: that's the Toyger with its dramatic striped and glittered pelt. The Toyger is being bred to resemble the tigers of the wild but in a package that fits easily into the modern urban lifestyle with the same nature as the domestic cat. The medium-sized cat has the rolling gait and vivid striped patterns of the wild cats without a single drop of real tiger blood. These miniature tigers are friendly outgoing cats that delight in being with their human companions. A young breed, the Toyger is in development as breeders work to replicate the pattern and colors of the tiger with ever-increasing accuracy. Tigers are an endangered species in the wild and many of the Toyger breeders are also very concerned about conserving the beautiful wild species that cats are created to resemble. 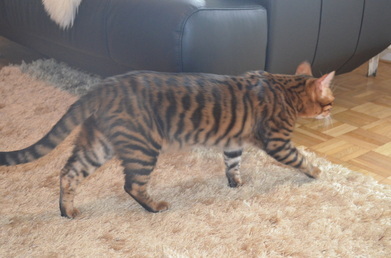 The Toyger coat pattern is unique in the domestic cat. 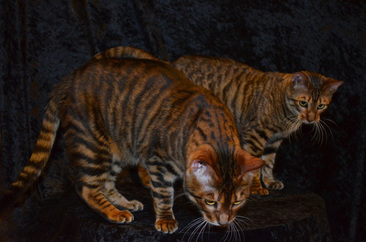 Instead of the vertical stripes of the mackerel tabby or the rounded rosettes of some spotted tabbies, the Toyger has broken, or branched, bold vertical stripes in a random pattern. Some of the stripes resemble rosettes that have been stretched vertically. The goal of the facial markings is to have a circular pattern. As with the tiger, the colors being sort are dark markings on a vividly bright orange background on the outer to top portions of the cat with a whited ground color on the undersides and insides. These beautiful dramatic patterns, each of which is unique to the individual like a fingerprint, are enhanced by the scatter of gold glitter over the top to enrich the coat pattern even further. COLOR: Brown Mackerel Tabby ONLY. Shape: Medium-sized. Long, broad and deep. Side view: 1/2 hexagon as defined by angle change points of chin, nose, forehead and back skull. All contours well-defined, muscular and rounded. Ears: Rounded. Small preferred. Set as much on the side as on the top. Thickly furred temples and ears preferred. Lynx tipping undesirable. Eyes: Small to medium, circular with gentle hooding of upper inside. Set back into face, and on slight bias toward base of ear. Rich deep color preferred. Chin: Very strong. Deep, wide. Bite must be correct. Muzzle: Medium length to long and deep with well-defined, rounded muscular contours. Full face view: a long inverted heart shape from forehead to rounded whisker pads. Nose: Muscular, long, and rounded, widening toward end to at least as wide as the space between the eyes. Greater nose leather width is preferred, depth is shallow. Profile: Biplaner: angle change above the eyes. A slightly concave nose line acceptable. Torso: Medium to deep, long and muscular with rolling contours; strong and robust but not blocky. Strength is in the forequarters. Shoulders may interrupt top line. Chest is broad and deep, never interrupting neckline from head to foreleg. Legs and Feet: Medium length such that the space between the ground and the body is equal to the depth of the torso. Legs as long in back as in front. Long toed, well knuckled feet seem large. Tail: Very long and muscular with blunt, rounded tip; rope-like. Set low and carried low. Boning: Very large, dense, robust; never delicate. Length: Coat is short except: markings may be slightly but uniformly longer than ground colored fur on body for a sculpted effect. Longer temple and jowl ruff fur is preferred. Texture/Density: Fur is thick, luxurious and unusually soft, plush but resilient. Glitter: Some glitter required. The more the better without undue loss of contrast or whited ground. COLOR: Tabby markings shall be virtually black to brown or even tan. Very dark markings on a richly colored rufused ground is preferred. Markings uniformly dark from tip of hair to skin are preferred. Mouse colored undercoat is acceptable. Whited ground color shall be as uniformly light to as white as possible and appears as per pattern requirements below. Contrast: All colors next to each other should be as different in value as possible. The visibly noticeable difference in color and value between two coat colors should be great or high between the tabby markings and the background color, and high between the dorsal orange background ground color and ventral whited background ground color, and high between the dark ear color and the lighter "thumb print," and high between the whited ground color of parts of the face and its modified tabby markings. Markings pattern: Modified mackerel tabby. The contrast of markings to ground pattern must be extreme and distinct; giving a clear, sharply edged pattern. Ground pattern: A modified dorsal (upper and outer), colored ground with a ventral (inner and under) whited ground as described and excepted below. Edges of ground areas should be distinct with contrast. Body: Body stripes shall generally be vertically aligned with encircling markings on neck, legs and tail. Bold, braided, nonuniform stripes including stretched rosettes are preferred. Some stretched spots are acceptable. Belly and inside of legs must be marked. Whited ground shall include ventral areas of belly, underside of base of tail, insides of legs, and chest. Spillage or wrap of whited ground onto lower sides, backs of legs and sides of chest for a greater amount of visibility is desirable. Paw pads and tail tip must be black. Face and Head: Facial stripes and markings shall be circularly aligned around the face. Preference shall be given to forehead butterfly markings and to encircling jowl markings. Traditional tabby markings moving radially away from the face for any distance are undesirable. Whited ground areas shall include throat, chin, outer parts of jowls and cheeks, and lower part of whisker pads as well as areas around and over eyes, spilling upward onto temples and forehead. Ears having dark backs, with a lighter to virtually white "thumb mark" desirable. Black mascara, lipstick and whisker spot markings and white spectacles are desirable. ALLOWANCES: Females may be somewhat smaller and less muscular than males and may exhibit no head ruff. Well-muscled males may lack shoulder to neck definition. Kittens may be somewhat longer coated, be less rufused and be rather uncoordinated. Color may vary somewhat in intensity seasonally. PENALIZE: Classic alignment of mackerel stripes on body (strongly suggesting a bulls eye or curved lines). Substantially darker markings on points. A dorsal stripe. Traditional tabby face markings ONLY. No glitter. Narrow nose leather. Excessive size or unmuscled bulk. Lockets. WITHHOLD ALL AWARDS (WW): Ticked fur that obscures markings. Belly or chest not marked. Tail tip not black. Blue eyes. DISQUALIFY (DQ): Mouth alignment not proper.